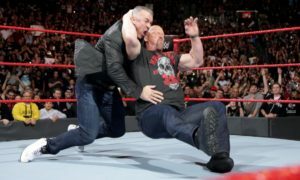 Not all of the news at this past week’s WWE RAW took place on live television or in front of the crowd for that matter. According to reports, WWE security turned away recently fired WWE Diva Melina Perez and refused to let her in the building in San Jose, California. 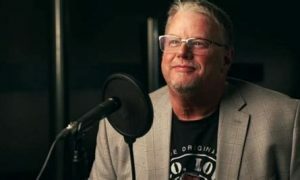 Wrestling Observer editor Dave Meltzer broke the story on his F4Wonline.com podcast Tuesday morning. According to Meltzer, Melina showed up with boyfriend John Morrison at RAW Monday night and only one of them got in. 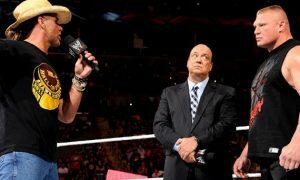 Meltzer reports that the WWE banned Perez from the event just days after being fired. The story gets even weirder. Melina was fired last Friday August 5 by the WWE. Meltzer reports that Melina continued traveling with the company. Melina continued to accompany Morrison on the road swing, just hours after being fired by the WWE. 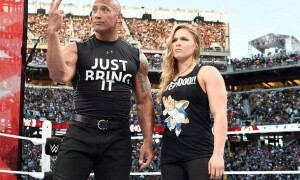 Obviously this presented a very tenuous situation for all involved, including the other WWE superstars and divas. So the WWE decided to end Melina’s farewell tour on Monday night once and for all. One can look at this a couple of different ways. Was it unfair of the WWE to kick her while she was down after giving the company seven years worth of service? Was it fair of the company to put John Morrison in an unenviable position of choosing the company or his girlfriend, a similar situation presented to Jerry Lawler and his wife many years ago? Was all of this even necessary with the tour ended Monday night and they could have pulled Morrison aside and made it clear to him out of sight that she was not welcome to future events? Another way of looking at it would be to question Melina and Morrison’s judgment. Melina has obviously stirred up a lot of heat in seven years with the WWE. Should someone that caused that much trouble for seven years be welcome into the locker room without consequences? Wouldn’t her showing up be perceived as Morrison and Melina making a mockery out of her firing? Was it fair to put other WWE superstars and WWE Divas in the position of getting heat for associating with her? Why should the WWE show her any hospitality after she went on Twitter and tried to start a revolt? There are certainly a lot of sides you can take if you wanted to turn this into a fair and balanced debate. I think the biggest dope here has to be Morrison. Morrison has reportedly had heat on him for several years thanks to his girlfriend. Their most recent heat came at WrestleMania 27 when Morrison admittedly gave Trish Stratus a hard time due what his girlfriend perceived as Stratus taking her spot. He finally appeared to get out of the dog house and once again, he finds himself right smack in the middle of a petty cat fight between the WWE and his girlfriend. I respect the guy for sticking by his woman, but he also needs to have a long talk with Jerry Lawler and find out how things turned out for him when he chose his wife over the WWE. Personally, I like Melina. I interviewed her once years ago and she couldn’t have been sweeter. However, her numerous incidents are well documented and saying she caused quite a bit of trouble during her WWE tenure would probably be an understatement. I hate to see things end like this for anyone because at the end of the day the company will move on and it will be her that looks like a fool. Yet at the same time, she probably couldn’t have picked a worse time to push the company’s hand. As for Morrison, well take a look at this recent win/loss record and tell me if he isn’t paying for his girlfriends bad behavior.